The Greek Orthodox Church of St. Barbara the Great Martyr. Saint Barbara’s Orthodox Church is a community of the Greek Orthodox Archdiocese of Thyateira and Great Britain of the ecumenical Patriarchate. It is under the direct care of His Eminence, Archbishop Gregorios of Thyateira and Great Britain. 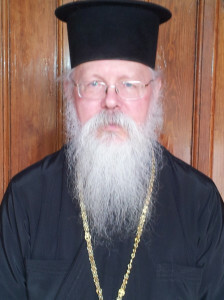 The parish was established in 1985 by the late Archimandrite Barnabas (Burton) of blessed memory at the direction of the then Archbishop Methodios. He ordained the first parish priest, Protopresbyter Alban Barter (now Emeritus) the following year. Initially, the community used the former Anglican church of Saint Barnabas, in which the first Liturgy was served by Archimandrite Barnabas on Sunday 15th December of that year. Saint Barnabas church was in rather poor condition even to the extent that, when it rained, the celebrating priest needed an umbrella and wellington boots! It proved impractical to attempt any long term tenure of that building and a search of the city was made to locate a suitable alternative. Eventually the opportunity of using one of the chapels in Overleigh Cemetery became possible and the community moved to across both city and river to the Cemetery Chapel in 1987. The first Liturgy was celebrated in our new quarters on 21st June following the blessing of the chapel with Holy Water. Once we had settled into our new church, the community set to work to convert the interior to a more suitable layout. A Holy Table was constructed and an iconostasis (which has proved to be rather like the Topsy who just ‘growed’!) was soon installed. The pews which once completely filled the church were removed leaving just a bench around the walls. A new choir desk has recently been donated and a new and improved iconostasis should be constructed in the near future. Though much still remains to be done to complete the work of conversion (is such work ever truly complete?) members and visitors alike all agree that the church is a blessed and peaceful place in which to worship the Good God. We are ever grateful to Chester City Council for the help and support they have given over the years in making this chapel an active place of worship. The present parish priest, Father Pancratios Sanders has served the Community since 1996. Apart from the liturgical and social life of the Community, parishioners have undertaken a number of initiatives to raise awareness of the Orthodox presence in Cheshire and North Wales. Among these are the Open Days held each year. These Open Days enable visitors to see the interior of an Orthodox church – often for the first time. Visitors are able to meet the local Orthodox and ask questions and simply to chat over a cup of tea or coffee. A service is offered, either Liturgy or Vespers (or both) and a talk on the Orthodox Church is also part of the programme. Specialist Open Days for school teachers are also available. This helps those faced with the teaching of R.E. in schools to be given facts about the Orthodox faith rather than the fiction which is presented in many text books today. Several local tour bus companies maintain a regular service of open-top buses with guides pointing out the many landmarks in Chester. These buses pass the cemetery gates frequently each day and the guides (several of whom are Orthodox) point out our church to the passengers. The Tower is the Newsletter of the Greek Orthodox Community of Saint Barbara the Great Martyr. Membership is a normal part of all of our lives. Many of us will be members of Gyms, sport clubs, automobile associations, political parties, etc. In the majority of cases we will be paying membership fees in order to get the benefits of these memberships; these will be paid as lump sums or as regular monthly/weekly contributions. It is via these fees that all these organisations finance the services that they provide to us.